It's not every Zumba class that you can shake your hips with Strictly star Matthew Cutler. Local Mums tell us why they love Zumba at fab local dance studio Matico. Since the Zumba craze first gripped the nation, gyrating hips and losing weight have been popular pastimes for local mums with new classes popping up all over our area. But one local class has mums convinced their Zumba is a cut above the rest. Matico Dance Studio is run by Strictly Come Dancing star Matthew Cutler and Latin American dance champion Enrico Stey. As one Local Mum put it: "If you haven't witnessed the Matico hips you haven't experienced Zumba at its best!" After Matt won Strictly with singer Alesha Dixon, and after Enrico's competitive dance career ended, Matt and Enrico both decided to open a dance studio with the emphasis on fun. "It was very important to us to create a space and atmosphere that is comfortable and relaxed," explains Enrico. "And for everyone to just come and enjoy themselves." "I have been to a lot of different Zumba classes and The Matico Zumba instructors are by far the best Zumba teachers I have experienced," says Local Mum Brenda. "Matt and Enrico are professional dancers who bring fun and laughter to an intense Zumba routine." 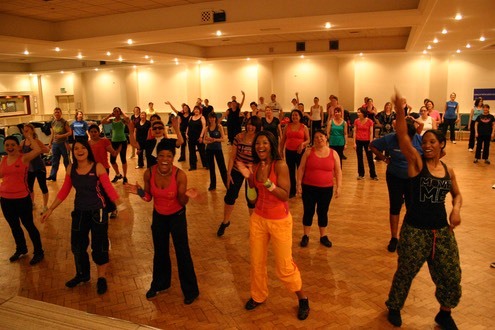 "I have been going to Matico Zumba�two or three times a week since their very first class back in November 2010," adds Local Mum Angela. "And I have to say I have loved every single one! Enrico and Matt ensure that every class is very energetic but also full of fun and laughter." It seems like having fun and laughing help you lose weight too. "I'm sure that laughing while doing Zumba burns more calories," says Angela. "At the very least it will exercise the face muscles!" "Attending�Matico classes has definitely helped me lose weight," agrees Brenda. "They have really helped me tone up, burning an average of 800 calories per session." "The group meets up for social events each month too so it's not all hard work!" adds Brenda. So if you fancy witnessing the Matico hips, or trying a Zumba class guaranteed to make you lose weight while having a laugh, why not give Matt or Enrico a try?